“I’m Willie Mays,” one might imagine a kid in New York City in 1955 calling out as he came to the plate in a midsummer day’s game of stickball. For kids growing up in Kansas City in the late 1980s, maybe it was Bo Jackson. There are players who occupy a certain time and place in the minds of fans, the player who in a way represents the city as a whole. For Indianapolis in the late 1980s and early ’90s, that player was Razor Shines. For the first few years of his career, Shines played mostly for West Palm Beach in the Florida State League. For part of the 1981 season through 1983, he played for Memphis in the Southern League. In 1984, Razor was promoted to Triple-A Indianapolis, where he would spend most of his time over the next decade, with brief call-ups to the Expos. In Indianapolis Razor made his mark on the city and became the player that youngsters growing up in the ’80s and ’90s idolized. In March 1984 the Baltimore Colts of the NFL famously moved in Mayflower trucks in the middle of the night to Indianapolis, and the NBA’s Indiana Pacers were coming off a season in which they had won only 26 games, and further would win only 48 games over the next two seasons. Indianapolis may have had big-league teams, but they were hardly the source of civic pride and engagement at that time. Another aspect to Shines’ major-league career must be understood in context. 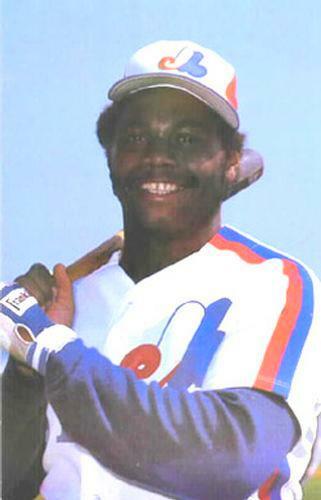 The Expos were loaded with talented players in the mid- to late 1980s, which must have made it exceedingly difficult to get at-bats for any prospect in the system at the time. Carter, Andre Dawson, Tim Raines, Tim Wallach, and Andres Galarraga (in 1985) were all ahead of Shines on the depth chart. Perhaps that provided Indianapolis with another reason to love Razor. He was, in their eyes, a major-league player, but was playing for them in Indianapolis. Shines’ last major-league appearance was also as a pinch-hitter, in a 10-9 loss to the Cincinnati Reds in Montreal in May 1987, in which he grounded out to the pitcher. He went on to play until 1993, mostly with Indianapolis but also including stops in Buffalo (the Triple-A affiliate of Pittsburgh at the time), and in Mexico City. After his playing career, Shines turned his attention to coaching and managing, briefly coaching the baseball team at Bishop Chatard High School in Indianapolis before managing in the Sally, Carolina, Southern, International, and Florida State Leagues throughout most of the 2000s. His teams had losing records in only two of the seven years he managed.13 Shines also coached in the majors, for the New York Mets and Chicago White Sox. One theme has carried throughout Shines’ career: winning. He was reluctant in a 2009 interview to discuss all of his championships, but he noted that he had 12 championship rings, including one from his coaching career with 2005 White Sox and when he was with the Philadelphia Phillies organization in 2008. He was on Indianapolis teams that won league titles every year from 1986 to 1989, and won Triple-A titles in 1988 and 1989. Razor Shines sought to make his career in baseball one of patience, hard work, and never quitting. He epitomized baseball in his approach to the game and the impact he made on the young players he worked with as a coach, but also in his contributions to a city looking for major-league talent. Baseball fans coming of age in Indianapolis in the decade Razor played certainly called out, “I’m Razor!” when stepping to the plate in their summer pickup games as they visualized hitting a double off the ivy-covered walls of Bush Stadium. 1 Razor Shines, telephone interview with author, January 29, 2014. 2 Dean Gyorgy, “Razor’s Edge: An Indianapolis Institution,” Baseball America, May 25, 1992, 24. 5 Razor Shines telephone interview. 7 Razor Shines telephone interview. 10 Ben Shpigel, “New Mets coach is more than just a name,” New York Times, February 24, 2009, B13. 11 Razor Shines telephone interview. 12 Razor Shines telephone interview. 15 Hugh Bernreuter, “Los Angeles Dodgers take ‘Shines’ to father-son combination for Great Lakes Loons,” MLive.com, April 3, 2012.